It's Halloween and I think about trying to imitate Shogo B'Stard's post on "One Good Scare" where he talked about Spielban's Youki and Flashman's Zoburanda (where Changeman actor Hiroshi Kazuoki appeared as a guest star) -- I just thought I'd want to get nostalgic about those "good old days of Long Long Ago 20th Century" -- back when Super Sentai had that much nightmare fuel together with some Kamen Rider and Metal Hero. But as said, this entry is subject to criticism for whatever I've missed! So try to bear with this rather long rant on nightmare fuel! Bonjour my readers! It's time for another weekly Lupinranger vs. Patranger review -- which I'd actually like to do another review. 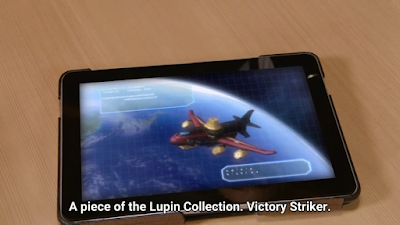 Yup, it's a Lupin Collection in space. I almost wanted to sing Kyuranger's theme song or wished the Kyurangers were here or the Dekarangers but none. Anyway, it's a fun episode with new Bandai merchandise. There's a new top secret intel and whether or not you guessed it right at first is something. I was thinking that le top secret intel was actually le Lupin Collection called le Victory Striker. Both sies of the coin namely le Lupinrangers and Patrangers are after it. Sidenote -- ever noticed that Noel keeps on talking about le need to gather le collection together and he has "confidential issues"? I guess he's le one who hired le Lupinrangers in le first place and they don't know it! 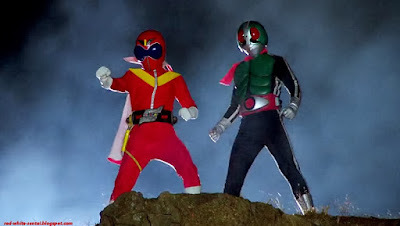 Fiveman may be one season that some counted as problematic due to it being the lowest point of Hirohisa Soda's career. 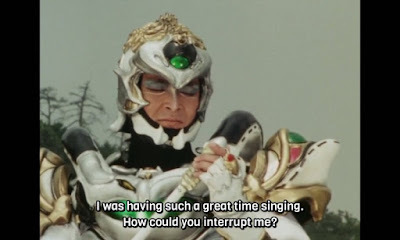 Chevalier is somehow regarded as a "very goofy villain" though he became one of my favorite villains in Fiveman due to how cool and charismatic he is -- while his smug personality reminded me of another villain I like namely Kiros from Maskman. He returned after his supposed retirement as Vulgyre's captain and gave a really cool song. I always wondered what song that was and I fell for that song! I remembered how his song made people unaware of the danger that his arrival posed. It even caused Kasumi and Remi to swoon over his charisma to the point that the Fiveman team is divided. Zone's two females Dordora and Zaza both also had a crush on him because of his charisma. Bonjour my readers! Well it's time for a review on Lupinranger vs. Patranger! This episode features Yadogar Gohome (which shows what his power is) and how he's making life SO HARD for both sides. The beginning of the episode features the arrival of Yadogar Gohome -- a monster who's trying to take over a certain area in Japan. 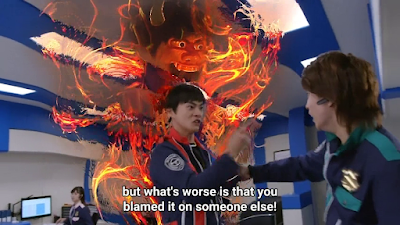 Both le Lupinrangers and Patrangers end up in yet another clash with each other and le monster. 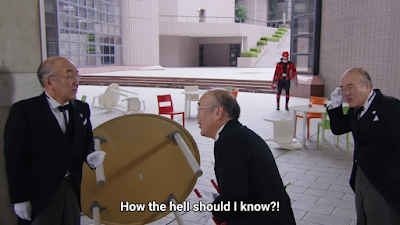 Is it me or is the situation getting annoying when both sides just refuse to work with each other -- most especially KEIICHIRO is that thick-headed?! They get hit by some beam that forces them back to their homes -- though it hasn't affected everyone. Bonjour my readers! It's time for le mandatory weekly Lupinranger vs. Patranger episode review! Now it's time for le rage of Keiichiro! Le episode begins with le Patrangers heading towards le abandoned warehouse. We see a new Gangler known as Pekka Zeppelin is doing some very complicated mathematical equations. What's so badass is that he uses some geometric and trigonometric applications in firing his slip up bullet. It hits at Patren-2 which causes him to frequently slip uyp. What happens next is plain and simple. A man in a suit appears to a disappointed Sakuya and offers him a bracelet that would supposedly "ease anger". It works on Keiichiro though there's something fishy about this one. As expected, it gets too predictable over this one since we're already too used to seeing most Gangler monsters appear in human forms. Well it's time for another throwback because it's Thursday. I admit, I've had more fun with Kyuranger last year than with Lupinranger vs. Patranger this year -- though this isn't saying I'm not watching this year but it's just that last year was more fun IMHO. What interests me is that while this year takes inspiration from Maurice Le Blanc's Arsene Lupin series (which in turn, inspired the comedic Lupin III Anime) -- maybe one old school popular culture reference that I didn't know or forgot way back is Isaac Asimov's hero called as Lucky Starr. Bonjour my readers! Okay, I'll be sounding much less enthusiastic right now and I feel like I may need to slow down. I probably need to take a bit of pacing by not sticking to an exact schedule within the week to when I write le episode reviews only when I can. Anyway, I'm just glad that there's still some readers here and there though I'd appreciate it if people can tell me how I can improve my reviews. Anyway, I decided to use some French again for le title which means "split personality" -- which this episode takes it way too literally! Le newest monster Doriun Sanp is causing people to be divided into three. This is really a funny scene when you just don't realize you probably have more than one hidden personality. It all surfaces in one hit. Worse, Kogure is even hit by it causing much confusion!